There was a time when the artist took his secrets to the grave. The thought processes and true intentions of a genius such as Leonardo could only be guessed at, remaining largely as enigmatic as the smile on his most famous work. Now, modern scientific techniques of analysis have given us the chance to travel back through time and reveal the secret history of one of Leonardo’s most influential works. Join us as we journey into the still-beating heart of Leonardo’s Madonna of the Yarnwinder. In 1499, war came to Milan in the form of an invading French army. For many this brought disaster, but for Leonardo it brought a commission. Florimond de Robertet, Secretary of State to the invading King of France, was keen to commission a work from one of Italy’s leading artists and neither he nor the artist was about to let the small matter of murder and mayhem interfere with the far more important business of art – proof, if ever it were needed, that art has always been a cut-throat business. The commissioned work, now known to us as the Madonna of the Yarnwinder, is among the most clearly documented of all of Leonardo’s paintings. We know, for example, that the artist was still working on the painting in Florence in 1501, and it is almost certainly the “small picture by his hand that has recently arrived here” mentioned in a letter dated 1507 from the Florentine ambassador to the French court. However, a “Madonna with a child in her arms” is among the possessions of Leonardo’s former assistant, Salai, in a list drawn up in 1525. 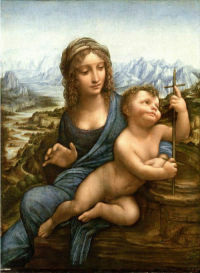 This suggests that Leonardo produced at least two versions of this painting, Robertet having already received his “Madonna” by this time. Unfortunately, from this point on the painting disappears from history and does not reappear until the 18th century. Leonardo’s painting has travelled down to us through the ages in several guises. Some have called it the “Madonna and Child”, others have called it the “Madonna of the Distaff”. The Italians refer to it as the “Madonna dei Fusi” (the “Madonna of the Spindles”), an unusual choice given that there are no spindles in the picture. The name “Madonna of the Yarnwinder” emerged because of the object held by the infant in the painting, a shaft of the type on which yarn was traditionally wound. But, as is revealed to even the most casual glance, the yarnwinder clearly resembles a crucifix. Was Leonardo trying to reveal a greater truth? Did he hope to portray something more than the love a mother feels for her child? 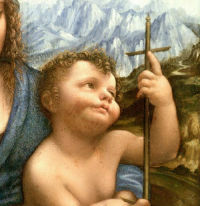 By portraying him grasping the “crucifix” so eagerly, did Leonardo hope to state that the Christ child is embracing His destiny, recognising His fate and apparently welcoming the opportunity to die on the cross in order to save humanity? One can only assume so. This innovative approach to storytelling has come to be known as “dynamic symbolism”, and it was an approach that radically reformed the way the subject was portrayed in general, influencing the work of true greats such as Michelangelo and Raphael as well as legions of lesser artists whom history has chosen largely to ignore. This process involved “facing up” the surface of the painting by pasting a layer of cloth on to the front of the picture in order to protect it during the subsequent phases. The wooden panel was then very carefully shaved away from the rear until the base layers of the painting were reached and the picture remounted on canvas – clearly not a job for the faint hearted. However, as we know from Leonardo’s account, and indications in others of his paintings, the Adoration of the Magi and the London Virgin of the Rocks, for example, Leonardo used a thin layer of lead white, the imprimatura after completing the underdrawing – the process of building up very thin layers of pigment over a white surface gives Leonardo’s paintings their depth and translucent quality. Leonardo’s meticulous layering of pigments was often paired with an element of risk. He was experimental by nature and the Madonna of the Yarnwinder shows evidence of this in some of the materials that have been found in the painting. For example, a bistre-like material, normally confined to ink, has been found in the brown areas of the painting. But how do we know so much about Leonardo’s materials and techniques? Find out in As revealed by science.